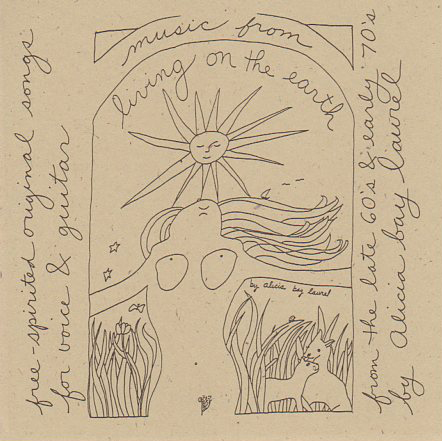 Posted on July 23, 2007 by Alicia Bay Laurel	in Blog and tagged travel diaries. 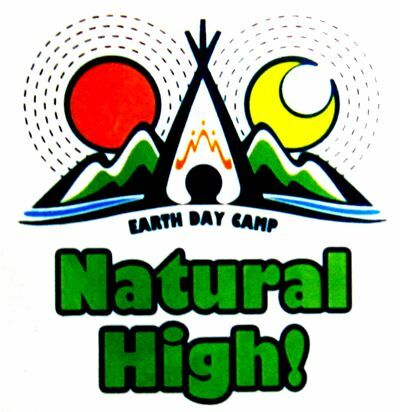 May 19 and 20, 2007, I attended the Natural High Festival (logo above), two hours drive from Tokyo at a campground in the forest, just outside the mountain village of Doshi. 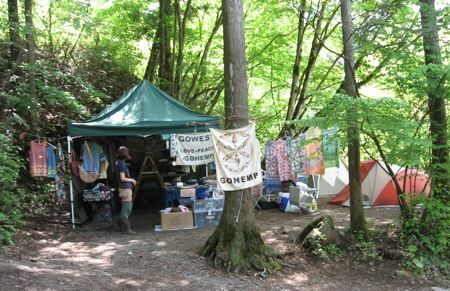 Last October 2008 I lead a weekend workshop here for Kurkku. This time, I would do two performances and sell my books and CDs at a booth. 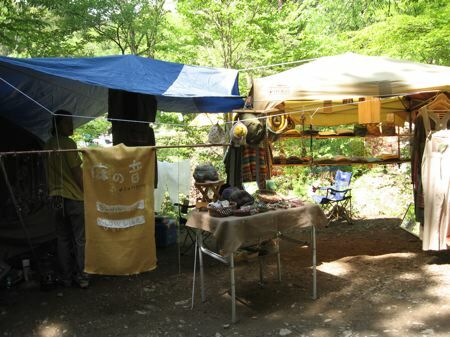 Kurkku sponsored my participation in the Festival and let me use part of their booth to sell my stuff. Soon after Jun, Ren and I arrived, we spent our lunch tickets at the vegetarian curry booth, which Jun’s chefly nose discerned as a good choice. It was! I came back for dinner. 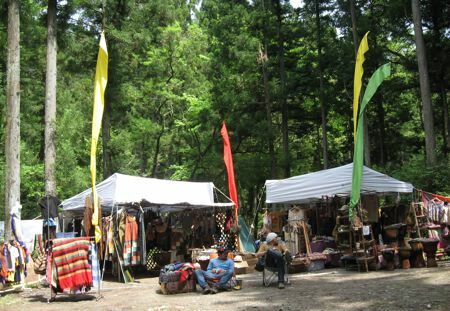 All around us, open-air booths, handmade clothing and drums, undulating banners, and relaxed people enlivened the forest. 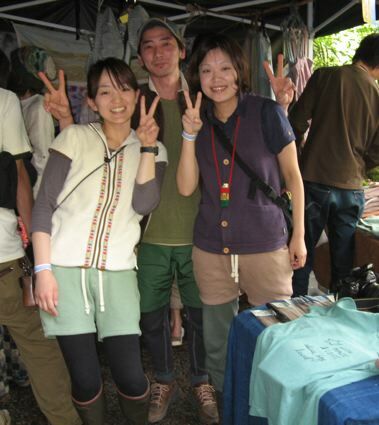 An air of friendliness permeated everyone. 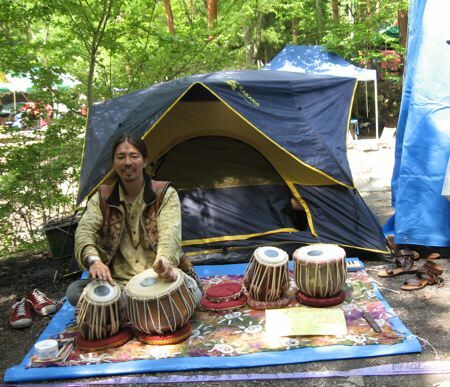 I could hear a tabla player drumming and chanting. 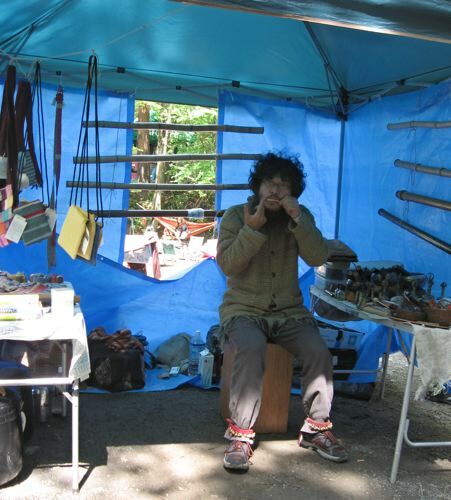 Nearby, I heard a musician playing a jew’s harp. Like the didgeridoo, another favorite instrument for drone-saturated trance music, and like Mongolian and Tibetan throat singing, the jew’s harp is an instrument whose melodies are overtones created by changing the shape of the mouth cavity. 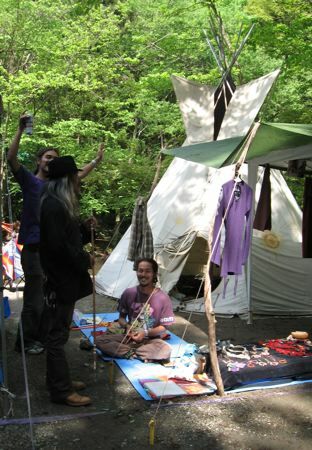 There was, of course, the requisite tipi. 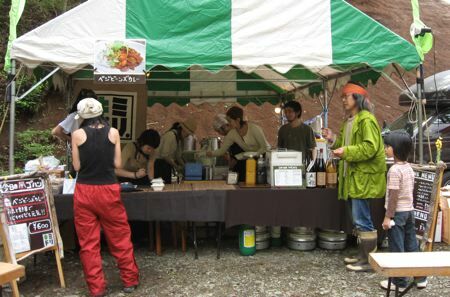 There was a booth with a banner that said “Slow Life,” perhaps from the Slow Life Cafe in Tokyo, where they serve Slow Food. Slowly. 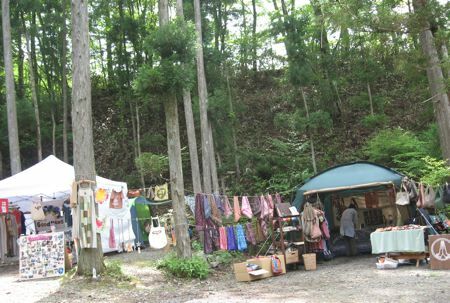 I visited the Good News booth (on the left), where tie-dyes, batik and patchwork hung for sale. 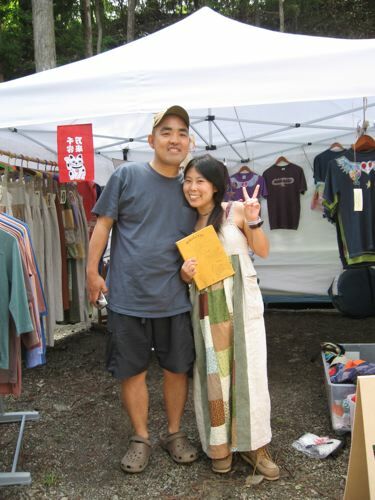 There I met Michiyo and Takeo, the owner/operators of Good News, and signed their copy of Living on the Earth. They knew I’d be at the festival and brought it along. 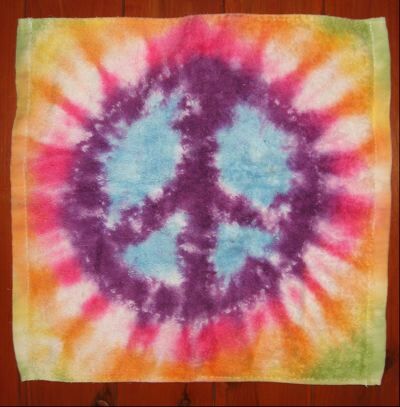 They presented me with one of their peace sign wash cloths. I knew I would display it on my bedroom wall instead of wash with it. So sweet. 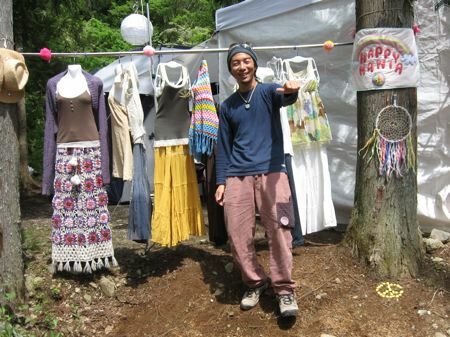 Next I visited the Go Hemp booth, representing the Go Hemp Store in Shibuya, Tokyo (motto: “Enjoy Life”), where they were selling hemp clothing. To my astonishment, they, too had books for me to sign, and hugs to spare. They even had me sign a t-shirt. 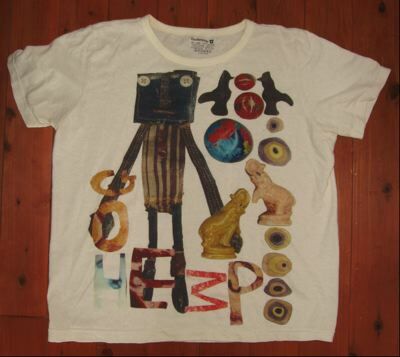 They presented me with one of their adorable signature hemp t-shirts.